In the desperate struggle to evade predators, many insects have evolved toxic or bad-tasting skin, a camouflaged body (‘crypsis’), or a startle response to scare away predators. In this “evolutionary arms race”, adaptations on one side call forth counter adaptations on the other side. One such defensive adaptation is to appear toxic using brightly coloured (‘conspicuous’) body coloration- this is known as ‘aposematism’ (“Ay-PO-Sematism”). This idea that signals are sent by prey to predators to indicate toxicity was first suggested by Wallace to Darwin in 1861- they theorised that this evolved to stop predators attacking toxic prey to benefit both sides. Aposematic warning coloration is a widely utilised form of defence used in all the animal kingdom (not just insects) and has evolved separately from many different evolutionary lines (convergent evolution). It can warn predators of defences such as a painful sting, repellent spray (such as a Bombardier beetle’s noxious chemical spray) or a toxic (or unpalatable) taste. Entomological examples of these bright colours include the malevolent yellow and black of wasps, the familiar black-spotted red body of ladybirds and the monarch butterfly’s bright stripes of orange and black with white dots. Even honeybees and bumblebees are striped to warn birds of their painful sting, although the vile taste of their sting must be learned by the predator through repeated encounters. Insects that have evolved to mimic another insect’s body pattern, sound or behaviour, usually resemble a dangerous, aposematic species. This is known as batesian mimicry, and can fool predators into thinking it has defences or a bitter taste, when actually it is harmless (this is not to be confused with Müllerian mimicry, where several toxic species resemble each other). These ‘cheats’ gain a survival advantage without having to produce metabolically costly toxins or evolve a ‘weapon’. An example of this is the hornet moth, a mimic of the yellowjacket wasp- it resembles the wasp’s striking body pattern, which deters predators, but it is not capable of stinging. However more mature predators may be able to detect a fake through experience or social learning. So a scarcity of mimics is actually advantageous for both the mimic and the model insect- too many mimics and the predators will stop responding to the warning signals. Aposematic colouration as an anti-predator strategy is simply an evolutionary alternative to other forms of protective coloration. Other ‘options’ for predator defence include background matching (a form of crypsis) and disruptive coloration, where bold and contrasting colours on an animal’s periphery act to break up its outline and confuse predators. Another intriguing form of protective coloration is known as ‘masquerade’, where the animal resembles an inanimate object (like a leaf) so the predator sees the prey, but mis-classifies it as something inedible. An extreme form of masquerade can be found in the devious pink orchid mantis, which also utilises this technique for hunting- it will wait until an unsuspecting fly lands on it to drink nectar, and instead be grasped and eaten! Despite the successes of these other forms of defensive coloration, aposematism remains a widespread and successful alternative anti-predator strategy to being camouflaged, which has evolved to protect prey from predators. Predators’ sensory and cognitive abilities have been important in the evolution of warning coloration, and there are ‘cheats’ that take advantage of these otherwise reliable signals of danger. Allen, J. A., & Cooper, J. M. (1985). Crypsis and masquerade. Journal of Biological Education, 19(4), 268-270. Endler, J. A. (2006). Disruptive and cryptic coloration. Proceedings of the Royal Society B: Biological Sciences, 273(1600), 2425-2426. Endler, J. A., & Greenwood, J. J. D. (1988). Frequency-dependent predation, crypsis and aposematic coloration [and discussion]. Philosophical Transactions of the Royal Society B: Biological Sciences, 319(1196), 505-523. Mappes, J., Marples, N., & Endler, J. A. (2005). The complex business of survival by aposematism. Trends in ecology & evolution, 20(11), 598-603. Schmidt, J. O. (Ed.). (1990). 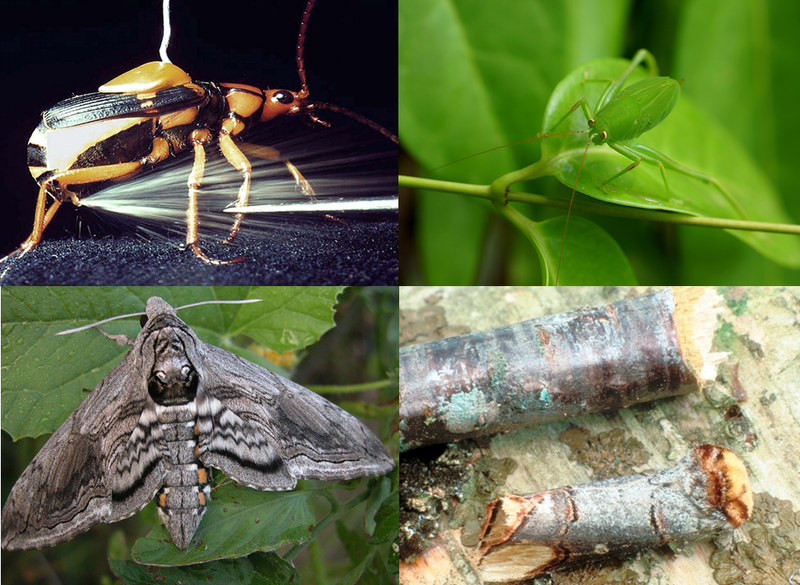 Insect defenses: adaptive mechanisms and strategies of prey and predators. SUNY Press. Sillen-Tullberg, B., & Bryant, E. H. (1983). The evolution of aposematic coloration in distasteful prey: an individual selection model. Evolution, 993-1000. Stevens, M., & Merilaita, S. (2009). Animal camouflage: current issues and new perspectives. Philosophical Transactions of the Royal Society B: Biological Sciences, 364(1516), 423-427. This entry was posted in Insect Bites, Uncategorized by harperento. Bookmark the permalink. Reblogged this on Pests and Pollinators. The stripes of honeybees don’t seem to work in putting birds off – I regularly see little sparrows hopping round my hives to catch returning bees. They must have learnt ways to catch the bees without getting stung.